Sorry I guess I wasn't thinking and it didn't occur to me yesterday that you might want to see the wrist warmer attempts. This one of the wrist warmers. I've done a few unmatched pairs because the tops are all slightly different. There's still some changes to be made depending on the top of the wrist warmer. They are suprisingly comfy. If you've tried tatting with wool before you know that really fuzzy wool doesn't tend to work. Its too hard to close the rings and it tends to break. The alegria is more sturdy and less fuzzy than other types I've tried. Well now, that's quite pretty! Well I am impressed with the fact that it is beautiful and with a yarn of any kind is not easy,and so much too! They're very pretty! I've only seen knit and crocheted wrist warmers before. 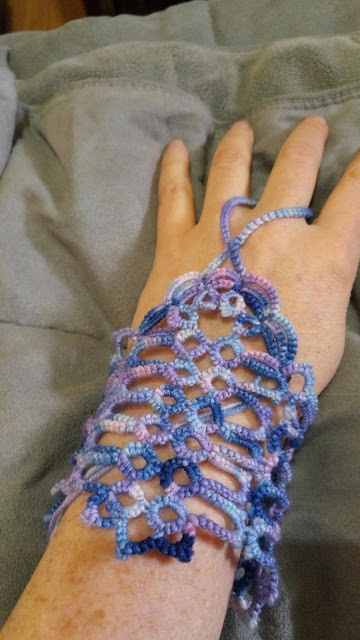 I love seeing new applications for tatting!